Clint Orms Scalloped sterling trophy buckle. 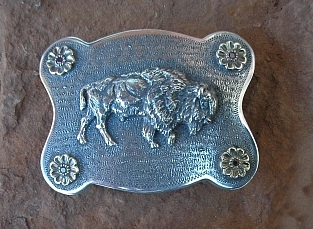 Overlaid sterling buffalo with 14k rosettes and cabochon rubies in each corner. Wheat grass engraved. Size: 2.75" x 2", will fit up to a 1.5" belt.